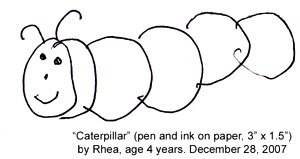 Rhea quickly draws a caterpillar on a notepaper. Then goes on, takes another paper, drawing several of them: Mummy Caterpillar, Daddy caterpillar, baby caterpillar… she, perhaps leant to draw it from the blackboard in her KG class, drawn by her teacher. Now she made it her own. She has added several dimensions to it. The sizes of her caterpillar are according to the designation. The sources, of course, are coming from her surrounds, which we call environment – personal and social. But what is her input from natural environment? We shall come to that later.